The Bottom Line: The best of J.K. Rowling’s Cormoran Strike series to date. For those not familiar with the series, Strike is a private investigator, ex–Royal Military Police Special Investigation Branch investigator and the illegitimate son of famous rock star Johnny Rokeby. Strike lost part of a leg in an attack in Afghanistan. He had previously studied at Oxford, but left in his second year to join the Army, following the death of his mother. In J.K. Rowling’s fourth Cormoran Strike novel, the PI is now famous in his own right. A mentally unstable man named Billy comes to the intrepid PI’s office to ask for help solving a crime dating back to his childhood that he may or may not remember clearly. Is it even ethical to take on an old case based on such an unreliable witness? Before he can decide, Billy leaves the office in a panic. For better or worse, Strike is hooked. 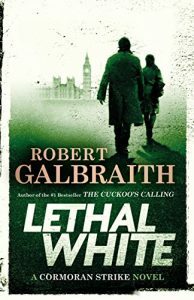 Strike and Robin Ellacott-once his assistant, now a partner in the agency-set off on a twisting trail that leads them through the backstreets of London, into a secretive inner sanctum within Parliament, and to a beautiful but sinister manor house deep in the countryside. What ensues is an absolutely sublime mystery novel. Now fully realized, Strike’s character is almost as distinctive as any in the canon of private detective literature, and his relationship with his partner has never been more entertaining. Maybe that’s why, when Strike inevitably gets into a tight spot, the stakes feel unusually high for a mystery series. Having Rowling at the helm doesn’t hurt, either. Having killed off a couple of lovable characters in her previous series, there’s no guarantee she won’t do the same here. While Book 4 would not be a terrible entry point to the series, starting from Book 1 is highly recommended due to Rowling’s enviable character arc with both primary series characters.